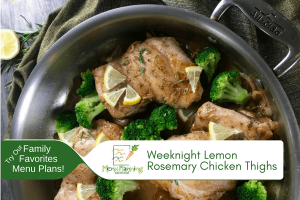 Here is a perfect weeknight lemon rosemary chicken thigh dish that you and your family will love. Not only is it loaded with flavor, it is quick, easy and prepared in just one skillet. You are going to love the amazing flavor you get from the timeless combination of fresh rosemary, lemon, and sautéed shallots. This is sure to become a new family favorite that is healthy and delicious. 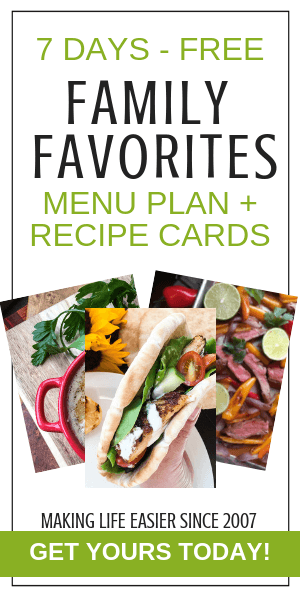 If you like this recipe – be sure to explore our signature Family Favorites Menu Plans for more delightful and simple recipes your family will love! 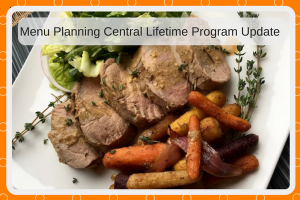 Tip: We recommend using organic lemons in this dish since the rind is left on during cooking. Return chicken and its juices to the skillet, along with the frozen broccoli and thin lemon wedges. Cover and reduce heat to medium-low, and simmer for 10-12 minutes, or until broccoli is crisp tender and chicken is cooked through. (Internal temperature should read 165°F on an instant-read thermometer). 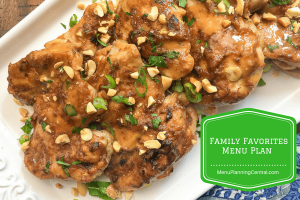 If you loved this recipe, you’re going to really love our Family Favorites Menu Plans featuring delicious, easy recipes just like this your entire family will love! Are you a member of our “Refer A Friend” program?